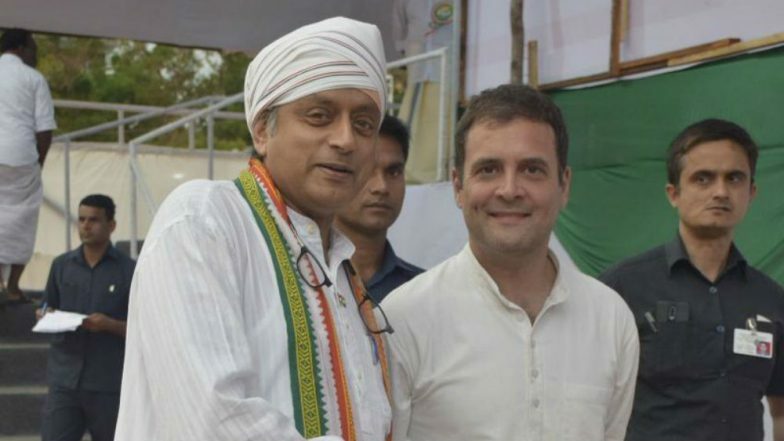 Thiruvananthapuram, April 17: Senior Congress leader Shashi Tharoor on Tuesday earned Rahul Gandhi's praise for campaigning a day after he suffered head injuries. Shashi Tharoor, who is Congress's candidate from Thiruvananthapuram Lok Sabha seat, was injured while performing a ritual at a temple on Monday. He was rushed to a hospital as he was bleeding profusely. "I was worried when Tharoor was hurt. I am happy to see that he was back in action. It tells you about his spirit. As Congress president, I am telling you, he represented you well in Parliament. He speaks for you in Parliament. He is an asset for Kerala," Rahul Gandhi said praising Tharoor's spirit for joining him in his campaign. Tharoor was admitted to the medical college ICU in for observation and later discharged. Shashi Tharoor Asks Will PM Modi Have Courage to Fight from Kerala or Tamil Nadu. On Tuesday, Defence Minister Nirmala Sitharaman, who was in Kerala for the BJP's poll campaign, had visited him in the hospital. Shashi Tharoor had also tweeted a picture of him with the Defence Minister and said: "Civility is a rare virtue in Indian politics - great to see her practice it by example!" Tharoor was injured when he was weighing himself on a giant scale as part of the "Thulabharam" ritual in which a person sits on the scale against a mound of offerings like fruit and sweets, equal to the devotee's body weight. During the ritual, the hook came off and its iron panel fell on his head. As far as election is concerned, Tharoor is facing a tough challenge from BJP's Kummanam Rajasekharan and CPI(M)-led LDF candidate C Divakaran in Thiruvananthapuram.